Editor’s Note: This is the fifth in an ongoing series of commentaries analyzing the individual Guiding Principles of the Certified Signing Specialist™ Code of Conduct, released by the Signing Professionals Workgroup in October 2013. Mortgage fraud has been on the rise in recent years, and loan origination fraud is widely regarded as the most common type according to a March 2014 report by the Office of Inspector General of the U.S. Department of Justice. Loan origination fraud typically involves a borrower or industry insider who misstates, misrepresents or omits information on a mortgage application that causes a lender to fund, purchase or insure a mortgage loan. Other types of mortgage fraud include foreclosure rescue, loan modification and short sale scams. The Code obliges the Certified Signing Specialist to report suspicious activity to the lender’s representative and closing agent for the transaction because both have an interest in mitigating any potential losses that could result. There are occasions when attorneys in fact sign on behalf of the borrower, which can be a potential suspicious circumstance. 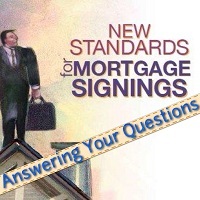 In such instances, Standard 5.5 requires an attorney in fact to be approved by the lender’s representative, which usually is done prior to the signing. If use of the attorney in fact is not obtained prior to the signing, Standard 5.5 only requires the Signing Specialist to obtain approval from the lender’s representative or closing agent in order to proceed. Finally, Code Standards 5.13 and 5.14 set the expectation that a Certified Signing Specialist will voluntarily disclose knowledge of a criminal act, whether committed personally or by others, to a lawful authority and fully cooperate with any investigation into the alleged criminal activity. Question: What do I do if I find that I have notarized a document that I later determine was false, and if I had known I would have rejected the applicant. Do I somehow cancel it, or just keep quiet? If a notary lies to harm another,nothing to do with real estate, should they lose the right to be a nitary? Isnt being a notery mean held to higher level of trust? For instance, a neighbor is a notory, but she doesnt like the person next door and lies to the home ownerscassociasion to get that neighbors evicted, lies to police saying the neighbor commited a crime, can that notory still be trusted? What if I know of a Signing Agent not following the Code of Conduct? They are giving loan advice! Hello Sarah. To help us answer your question can you please tell us what state you are located in?